Al-Nass (The People), and other television channels of “Satellite Salafism,” broadcast news of a year-old mediocre film trailer about the life of the Prophet Mohammad, made by an Israeli-Californian and championed by a Florida-based Christian pastor. Across the waters, radicals spurred each other on. The reactions in Cairo and Benghazi were swift. Crowds formed in front of the US embassy in Egypt and the US consulate in Libya, storming them, and, in Benghazi, launching a rocket-fired grenade which – it seems – killed four US officials, including the US ambassador to Libya, Christopher Stevens. The crowds in both Cairo and Benghazi included not only radical Islamists, but also groups such as Egypt’s Ultras, the soccer fan club that played an important role in the 2011 revolution. The media has concentrated on the presence of bearded men and black flags to paint these protests as the work of Salafis and to point the finger at Ansar al-Shariah and other fringe groups. The black flag (the banner of the eagle) does not, of course, belong solely to al-Qaeda or even to Islamic radicalism. It has become a commonplace symbol used by those who want a more robust Islamic presence in the public sphere as well as by those who want to live under an Islamic theocracy. Both claim the flag, so its presence is not conclusive about the currents that took part in this, and other such events. It will take time to fully understand the roots of such violent acts, after careful forensic reporting on those who came to the protests. Nevertheless, some preliminary observations can be made regarding the ongoing social convulsions, at least in the Libyan case. An earlier incident helps to highlight this point. In late 2005, protests across the world took place in reaction to a Danish newspaper, Jyllands-Posten, publishing cartoons that demeaned the Prophet Mohammad. This upsurge came to eastern Libya in early 2006 when an Italian minister, Roberto Calderoli, wore a t-shirt that bore that offensive cartoon. A demonstration of more than 1,000 people, mainly political Islamists and pious Muslims, gathered in front of the Italian consulate in Benghazi on 17 February 2006. The Gaddafi regime sent in its armed police, who opened fire, killing 11. After the police firing, a section of the middle-class that was not sympathetic to the Islamists turned against the Gaddafi regime. Intellectuals such as Fathi Terbil, Terbil Salwa, and Idris al-Mesmari joined a platform to bring justice not only to the families of the slain in 2006, but also for the families of those members of the Libyan Islamic Fighting Group (LIFG) and others who were massacred in Abu Salim prison in 1996. The protests were not just about the cartoons. They were also about the 1996 massacre in Abu Salim prison and about the collaboration of the Gaddafi regime with the War on Terror. From the late 1980s, Gaddafi’s regime had harshly repressed any signs of political Islam. Prisons were filled with bearded men, and there was no tolerance for any dissent amongst the population along Islamic lines. This is the reason why LIFG members fled the country for Saudi Arabia, Sudan, and of course Afghanistan and Pakistan. The Gaddafi regime was not able to reach the militants of the LIFG and associated bodies because it had no capacity to reach them in those far off locales. After 9/11, when the West wanted to outsource torture to prisons outside its direct control, Gaddafi (like Mubarak and Syria’s Assad) offered his services. In March 2004, the US opened a diplomatic mission in Tripoli, and the CIA opened up an office there as well. Later that month, Tony Blair came to Libya, the first British prime minister to visit the country since 1943, and he spent considerable time talking about commercial interests (to get Shell its oil concessions) and the “common cause” in fighting terrorism. Blair was excited to meet Gaddafi (the “Leader,” as the British faxes to Tripoli put it) in his tent because “journalists would love it. If this is possible, No. 10 would be grateful.” As quid pro quo, the British organized the “rendition” of LIFG militants into the hands of the Gaddafi regime. “This was the least we could do for you and for Libya to demonstrate the remarkable relationship we have built over the years,” wrote Sir Mark Allen, head of Britain’s MI6, to Gaddafi’s henchman Moussa Koussa on 18 March 2004. The specific matter here was the “safe arrival of Abu Abdallah Sadiq,” the nom de plume of Abdul Hakim Belhadj, former emir of LIFG and now leader of the al-Watan political party (and a crucial leader of the military part of the 2011 Revolution). The elections in July heralded an opening for Libya. The results were celebrated in the West, since it seemed that unlike Tunisia and Egypt, the Islamists had not garnered the fruits of the revolts. The neo-liberal sections, led by Mahmoud Jibril’s National Forces Alliance won a majority. Jibril had been the political face of the Libyan Diaspora. After a career in the Gulf, he returned to Libya in the 2000s at the urging of Saif al-Islam Gaddafi, who wanted to convert his country into a “Kuwait on the Mediterranean.” When things did not work out as planned, Jibril got frustrated. He had no political base. When the rebellion broke out, Jibril threw in his lot with it, and thanks to NATO intervention, was able to use his affinity with the West to put himself into a position of political power. His victory in the polls vindicated NATO, which now felt that it had its man in charge – open to sweetheart deals for Western oil companies and eager to push further the neo-liberal agenda that was constrained five years ago. The rules for the July elections provided Jibril’s Alliance with a clear road to victory. Only 80 of the parliament’s 200 seats could be contested by political parties, with the rest were to be filled with independents. That was always going to be an advantage for Jibril’s Alliance because it could attract these parliamentarians into its bloc. The whiff of proximity to the West, and the fears of Islamism, helped cement that linkage. Very strict rules against the Muslim Brotherhood’s use of its primary ideology constrained Belhadj’s political force, the Justice and Construction Party (JCP), from moving its own agenda. Furthermore, disagreements between two central Islamist leaders, Ali al-Salabi and Belhadj, prevented the JCP from fighting the election with robust unity. Gaddafi’s anti-Islamist propaganda of the past two decades certainly has not dissolved, and with only 18 days to run an election campaign, it was clear that the JCP would not have been able to make inroads into sections who remain suspicious of it, and are yet sympathetic to its general orientation. That is to say, they might not share its tendency toward theocracy, but it does share its frustrations at what is perceived to be the Arab world’s enduring humiliation at the hands of the West. Jibril does not know how to address this humiliation, comfortable as he is with the Western agenda. The results of the July elections, therefore, are not representative of the social character of the country, where political Islam plays an important role. Talk of the “defeat” of the Islamists in the ballot box further inflames a section that believes that it remains integral to the future of Libya. 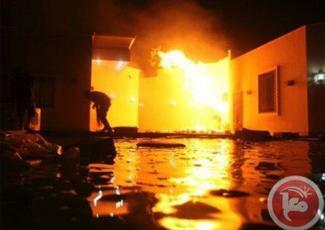 It is too early to make a full judgment about the attack on the US consulate. Details are slowly emerging about the nature of the protest and the firing of the grenade at the consular building itself. But it is not too early to assert that the protest emerged out of a long-standing sense of humiliation and anger at the sanctification of Islamophobia in the West and at the failure of the political institutions in the new North Africa to take into consideration the sacrifices and the programs of the Islamists. Posted on November 2, 2012, in Middle East and tagged Imperialism, Libya. Bookmark the permalink. Leave a comment.